This postcard provides a slightly better view of the houses next to what used to be the coach house of Tor Cottage (Tor House); it was described as a Gardener's Cottage in the 1911 census and was then the home of Edwin Allsop and his wife. Ten years earlier, the 1901 census recorded the addresses of the first three properties as Tor Cliff Cottages. The Taylor family were living at no.1, Lydia Ramshall, widow of the policeman John Ramshall, was at No.2 and the Warings were at No.3. Valentine, the card's publisher, registered both a black and white and a coloured version of this card in 1892. 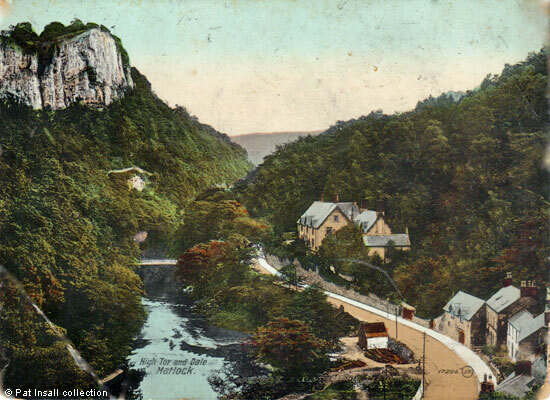 The Topham family were living at Tor House at that time and their coachman, Frederick Buckley was inhabiting the coach house next door, then called Tor Cliff Cottage. It is interesting to note that some of the detail is lost on the hand coloured version when it is compared with the sepia picture. For example, the footpath of the coloured picture is quite a bright white. Yet if we look at the coach house in either the larger sepia image above or the enlargement below we can see that the pavement dips and also slopes down towards the doors which are, in reality, considerably taller than they appear in colour. Details of the various riverside buildings are also lost in the coloured version. As can be seen from the detail below one of them had an open sided storage shed on the side facing the camera, probably where the wheelwright worked. 1. "High Tor and Dale Matlock ". Giant Postcard, printed by Valentine & Sons Ltd, Dundee, London & New York, No.17206. Not posted, but marked to take a halfpenny stamp. It also states that 'Only name & address of sender allowed. If any other writing Penny stamp is required'. From the collection of Pat Insall. 2. 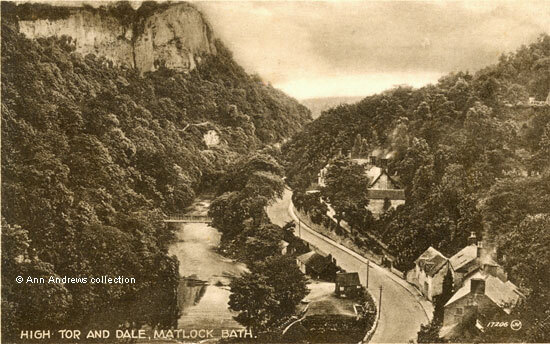 "High Tor and Dale Matlock ". Sepia card published by Valentine on a Lettercard, also No.17206. © Ann Andrews collection. The 1911 census is available on Find My Past (external link, so will open in a new tab or window). Read the census transcripts for the Topham and Buckley families in the 1891 census. Dr. Herbert Topham advertised in Kelly's 1891 Directory and was still shown in Matlock Bath in Kelly's 1895 Directory. He had left the district by 1899, when the next directory was published.